Tourists, locals, and even a few ghosts have enjoyed a dimly lit watering hole on the corner of Chartres and Iberville - north of the river, south of the Acme Oyster Bar and directly across from the Marriott. The Jimani provides a can?t-miss slice of the New Orleans drinking scene. Neither a lounge nor a restaurant by common definition, the Jimani is a hole and a find at the same time. And that is meant as a compliment. With its copper bar counter complimented by a dozen tables the Jimani is a great place to escape the heat, the rain, the ?I?m with Stupid? t-shirts, or the peddlers that are a part of life in the Big Easy. Places like this are hard to find in the French Quarter. In fact, the Jimani measures up to four basic tenants of a great joint: cold beer, great music, satellite sports on television, and a grill that can make a mean hamburger or Crawfish Pasta. The door is always open but it might as well be swinging. 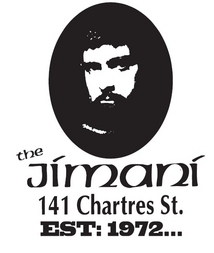 It seems like everyone that is part of New Orleans hospitality industry makes a pre or post-work visit to the Jimani. The bartenders seem to have a personality reflective of the place, whimsical and efficient at the same time, and certainly give you the impression that they are familiar with the business end of a barstool themselves. Join us for a couple of drinks and a couple of songs on the juke box you too may find yourself sitting on top of the world in this city below sea level. Around the world today, high-end lounges are serving a variety of cocktails. The Jimani's mixologists are like chefs behind the bar and they don't want to be limited to standard fruit-flavored infusions. 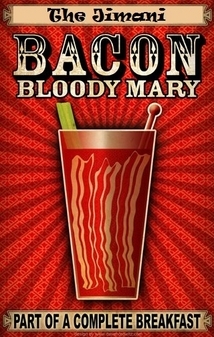 Our bartenders have found that the savory aspect of bacon makes a great dominant profile in our World Famous Bakon Bloody Mary garnished olives, greens, and (of course) MORE BACON! No trip to New Orleans is complete with out one! 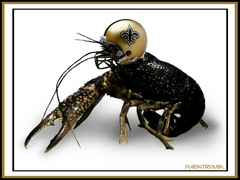 You can’t watch a Saints Game on an empty stomach! Well, you can, but why would you want to? Food complements the viewing experience-and it’s usually one of the few times a person’s diet permits the types of food commonly found at football game parties. No matter if a person is eating from a seat on the 50 yard line of the Super Dome or on a stool at the Jimani, food is as much a part of the plan as the game. For some the main course must fit the geographical region of the game, whether it’s a Chicago Style Hot Dog from the windy city, Eugene’s Crawfish Pasta from N’awlins’, or a rack of ribs for a game down south. (In California, who knows?) The key to football food is that it shouldn’t detract from the game or the conversation. The best food for football is quick, hearty, and should always be enjoyed with your favorite brew.